Judy Canova started her career in vaudeville in a trio known as The Three Crackers. Gaining popularity, they starred on Broadway and in radio before Canova turned solo. Moving to Hollywood she became Queen of Republic Studios, starring in many hit films in the 1940s and 1950s such as LAY THAT RIFLE DOWN, JOAN OF OZARK, OKLAHOMA ANNIE, TRUE TO THE ARMY and SCATTER BRAIN. 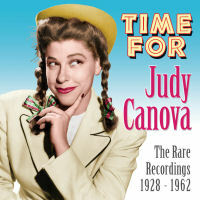 This album contains 27 rare Canova tracks first time on CD, beginning with a track from 1928 and ending with her last recordings made in 1962. Included are two songs most associated with her, themes she used to close her radio show, GOOD NIGHT SOLDIER and GO TO SLEEP, LITTLE BABY.